This article focuses on a IDX Broker Platinum-only feature. The Lead Signup Widget provides you with an easy way to embed a Signup form for your leads into your website navigation or sidebar. As additional fields are added to your lead registration settings, you can also use this as a contact form. 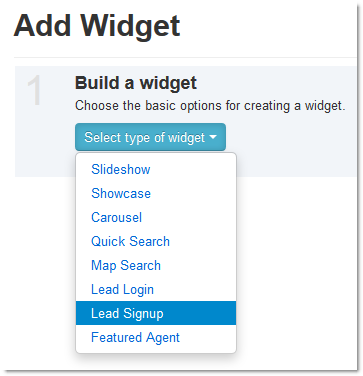 To generate a Lead Signup Widget, click Designs from the main menu, Widgets from the submenu, and Create from the drop-down menu. Select Lead Signup from the drop-down menu. Name your widget something appropriate. This name will not be shown on your website to your visitors, but it will help you keep your widgets list organized, especially if you make more than one Lead Signup widget. This step displays your Lead Signup widget code. Simply copy the code displayed here, and paste it into the HTML of the webpage where you would like it to appear. For WordPress users, you can paste this code into a blank "Text Widget", or use the IDX Broker plugin to add shortcodes. 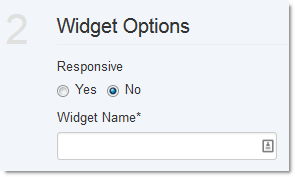 From here you can use the buttons at the bottom to Preview your Widget, go Back to Widgets List, or Create Another Widget.